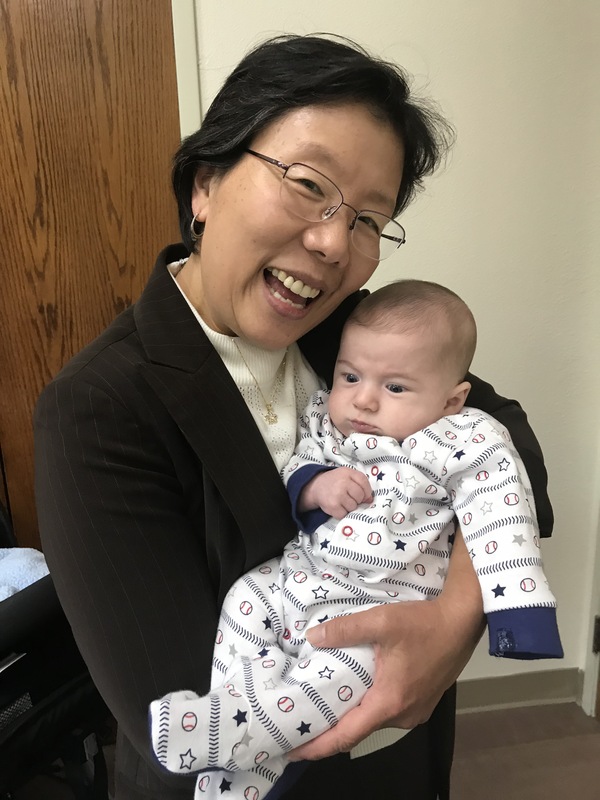 Ever since I returned to church a few weeks ago, without William he had not yet started his vaccination schedule, I had been asked multiple times when he would make his debut. Today was that day. I had set an alarm, which I turned out not to need as William had woken up early to breastfeed. I made sure to get to church extra early so we would have a chance to check things out before the service started. One of the first people I saw was the Children’s Ministry Leader, Peggy Joy. She helped me show William the manager outside of the sanctuary. As today was Epiphany (which I did know) the church kept up their Christmas decorations for one more day (which I did not). Upon seeing that the Christmas tree was there, I had to find the moose ornament that I had chosen from the available ones to hang in honor of Matt’s fondness for the National Lampoon’s Christmas Vacation moose head glasses. We tried to get him to face the camera for a close up photo, but that was not the direction he wanted to look at. 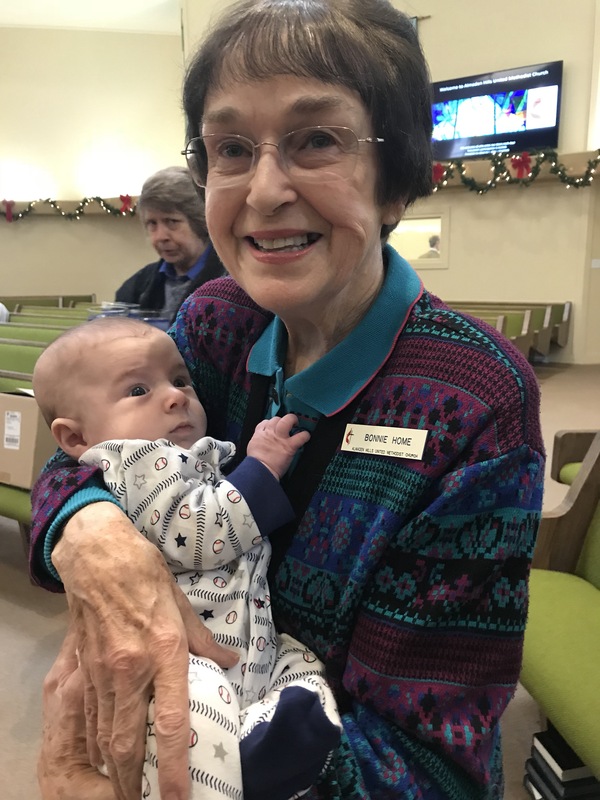 Bonnie, one of the first people to officially welcome me at the church wanted to be one of the first to hold him. She recognized his baseball themed sleeper, a present from Sarah, right away. 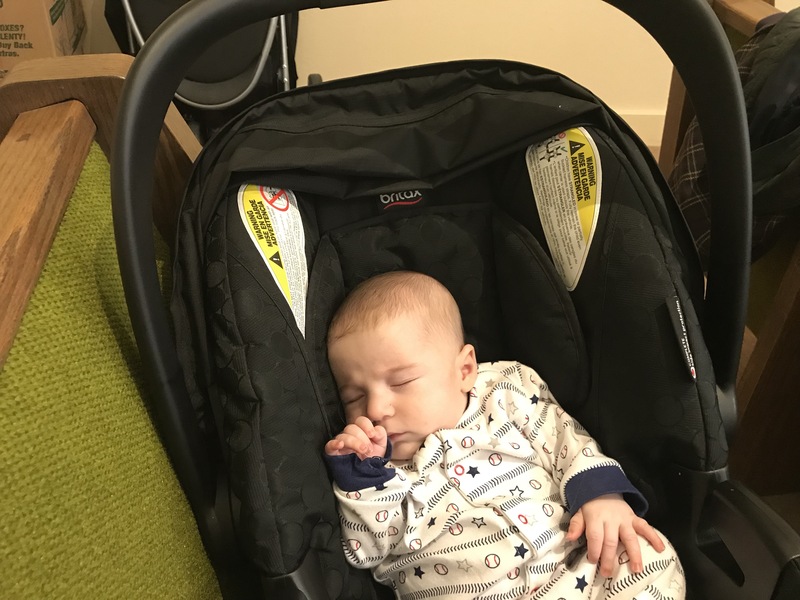 This special sleeper was chosen in part as William’s middle name, Hunter, is partially related to our appreciation of SF Giants player Hunter Pence. 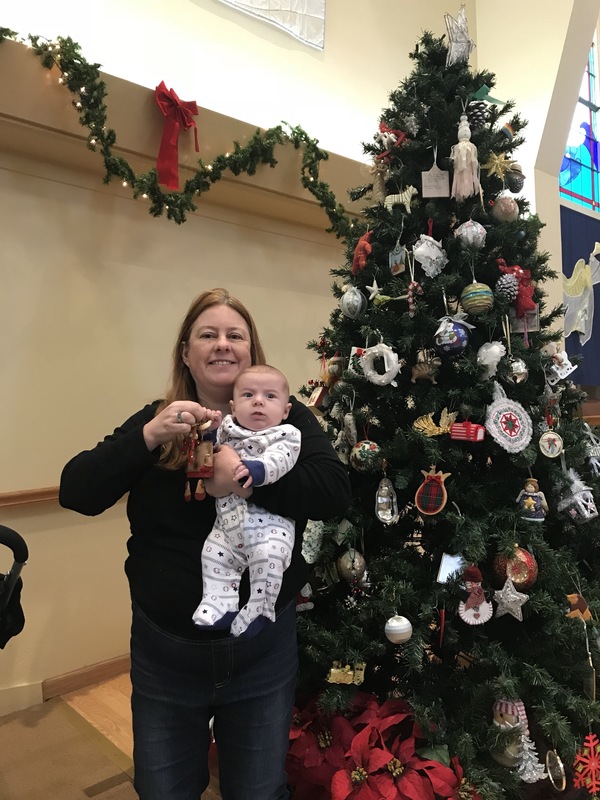 While I intended for William to set next to me at church, I also wanted to give him a chance to acclimate to the day care center as I may place him there at some point if I’m part of an after church activity or even during if he is extra fussy. 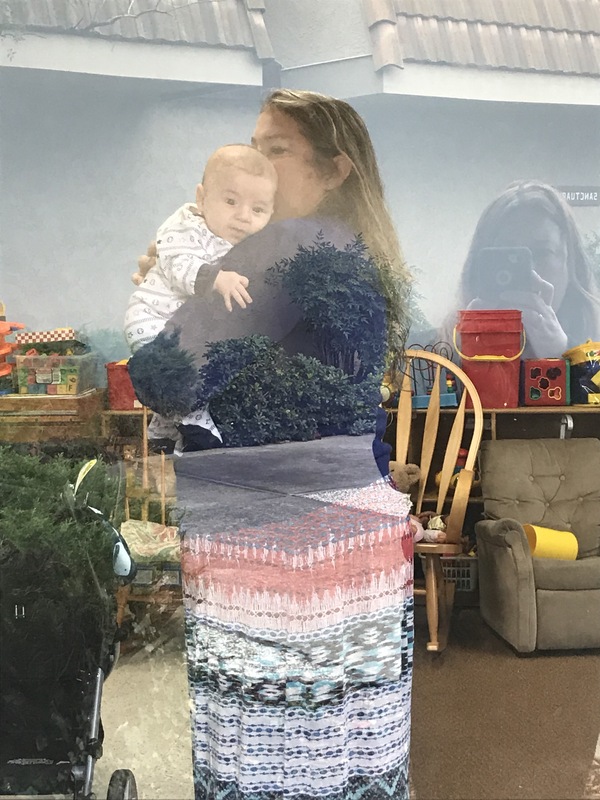 In this photo Sarah, the main day care lead, hold him while I say goodbye/take a photo of him outside the window. A friend says he’s smiling at me, which may be the case. When it was time to go into the sanctuary before the start of church, many people came over to look at him and say hello. 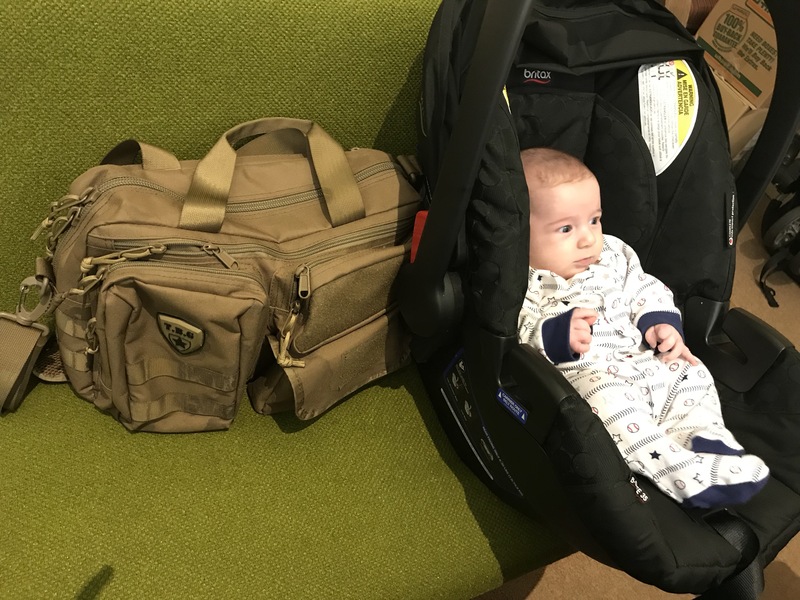 Ever since I’d seen Ashley and Sean many months ago with their daughter Kira in a cars seat with their Tactical Diaper Bag, I’d looked forward to the day I could take a photo of a similar moment with our child. William alternated in moods and needs throughout the service. 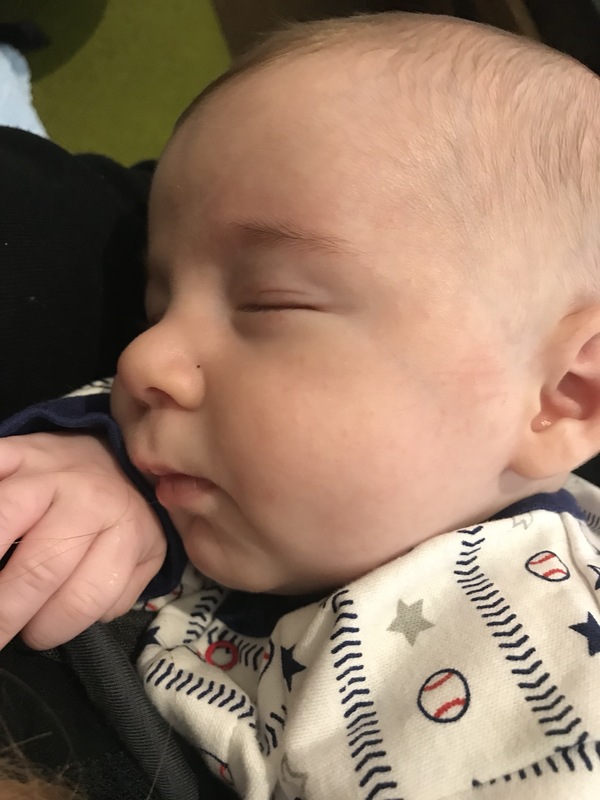 He was fed and bounced, and at one point seemed to be crying just as the song being played was a little too loud and boisterous for his taste. 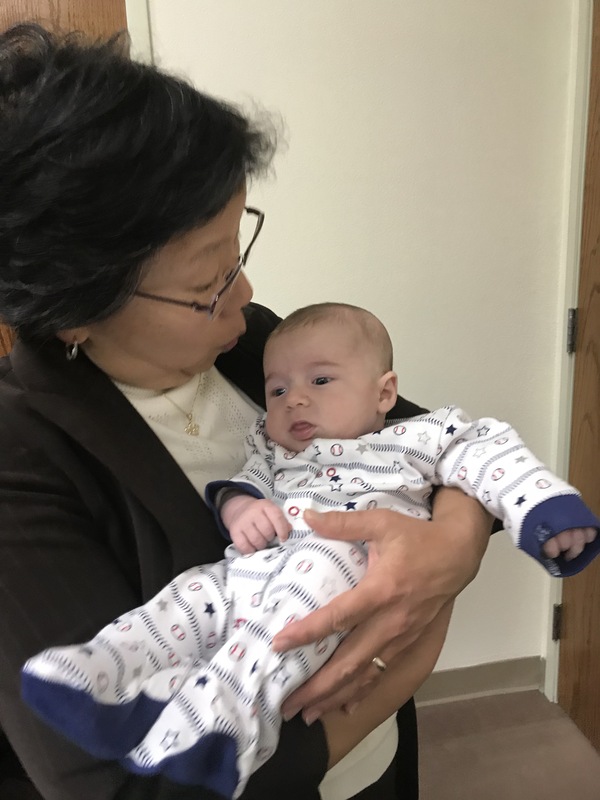 Pastor Mariellen even commented what a joy it was to hear the noise of little babies in church, perhaps sensing I’d been a minute away from taking him out to the day care. Shortly after, he fell asleep in my arms and slept though the bulk of the service. I was able to return him to his car seat and he kept sleeping away. After service many people came up to see him. 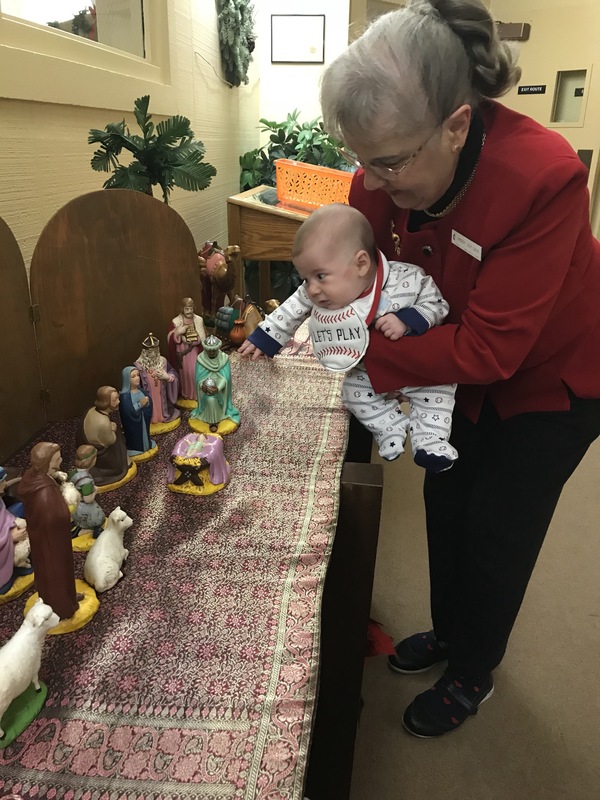 Several said they hadn’t heard a peep out of him all service long even though he had been crying at one point. 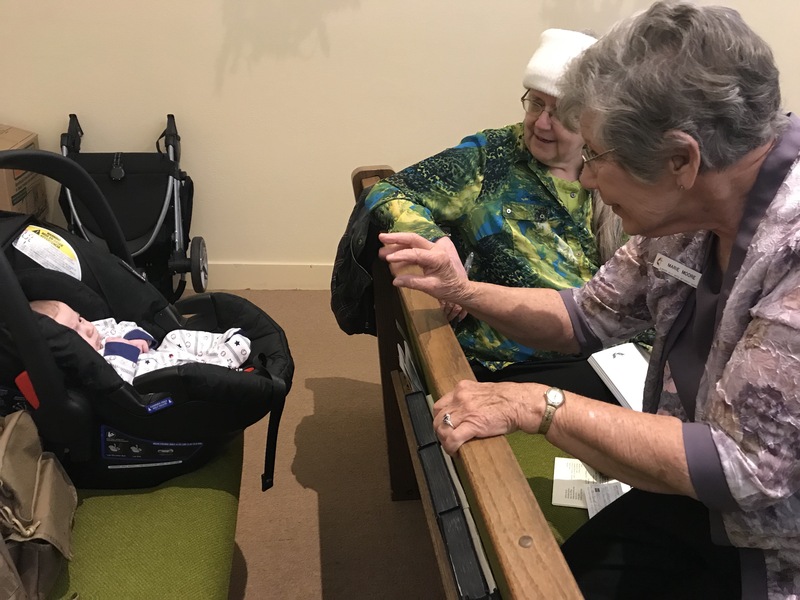 The church has three babies that are the children of regular attendees. 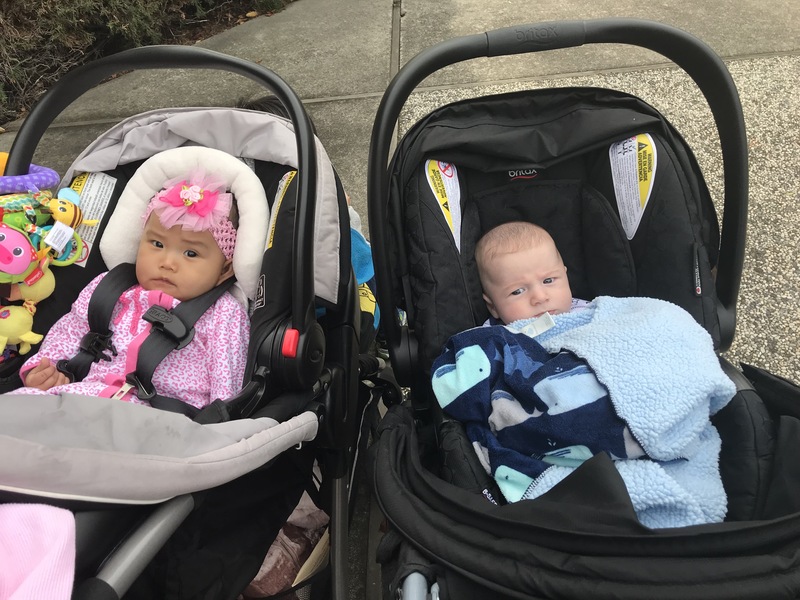 William is the youngest one, and here he is pictured with the oldest. After service we visited Pastor Mariellen. 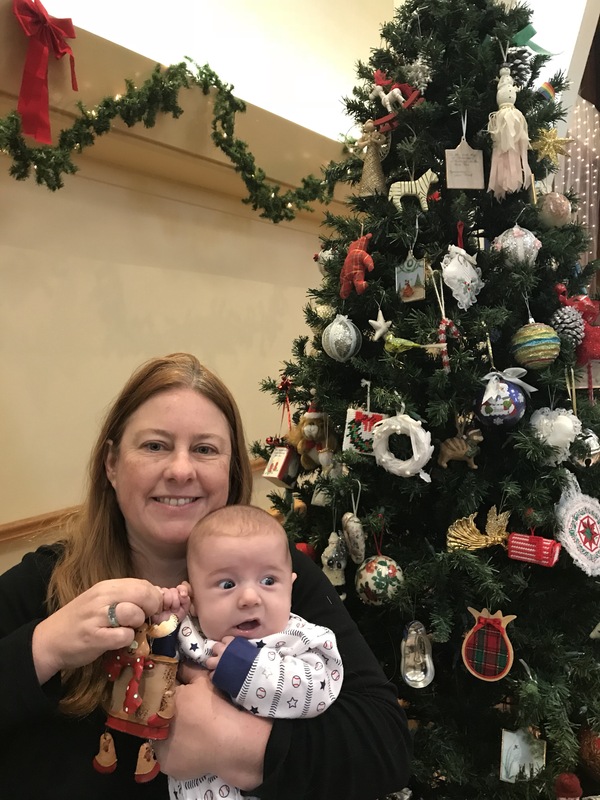 She had been looking forward to holding him and remarked on how big he had gotten since she last saw him a few weeks after his birth. 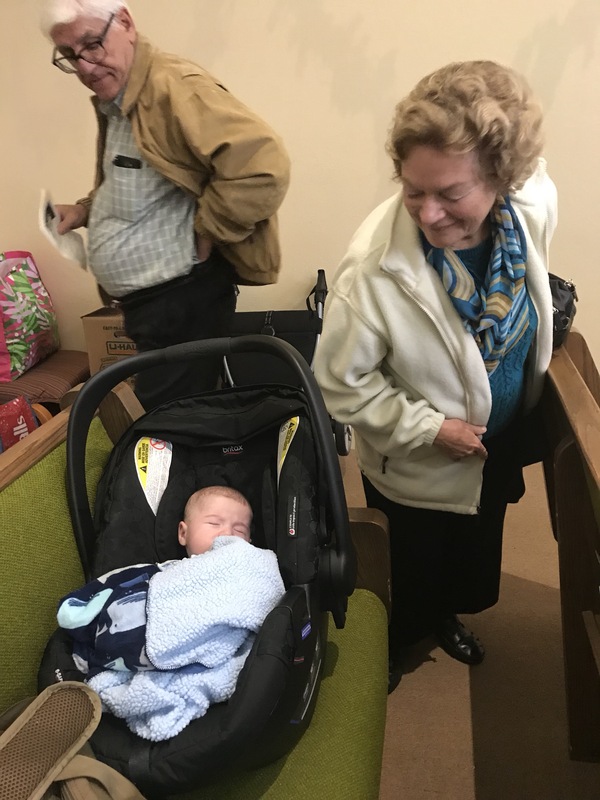 She’s so great with church members of all ages, but especially the young kids. William’s first visit went very well. As not everyone was there today, he still has many more people to meet and vice versa.